My lovage is tall enough to start eating! This perennial herb, Levisticum officinale, is not well known today, although it was popular in the middle ages. Some of its common names, including Love Parsley and Love Root, hark back to its use in love potions; today research is beginning to indicate it may be useful in liver disorders. I like it for its flavor, and for its personality. It tastes somewhat like parsley  but so much richer and more aromatic that it stands on its own. Minced and sprinkled over a slice of fresh, vine-ripe tomato... or cooked into a beef stew  a real treat. Some people may be familiar with it, without knowing: it's a major ingredient of one popular herbal seasoning salt. You can candy the stems and seeds; the seeds are also good in starchy dishes. The root can be cooked or pickled (peel it first); stems steamed and eaten by themselves. Always use young stems and leaves, they have much better flavor. As a member of the carrot family, like parsley, dill, fennel, and angelica, it has flat-topped clusters of tiny flowers, which look like parasols: in lovage, they're yellow. These flowers produce nectar that attracts several species of beneficial insects. In particular, the adults of parasitical wasps feed on it  tiny insects that don't bother humans, but lay their eggs in garden pests, so that when the larvae hatch, they feed on the pests from the inside: natural control for aphids, scale, cabbage moth caterpillars, and tomato hornworms (among others). The shoots that are a few inches tall today will be a foot tall in less than two weeks; four feet tall in a month. 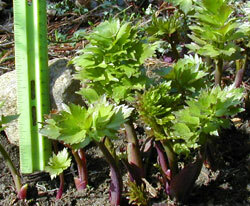 By mid-June, flower stalks reach seven feet. The plant stands out, asserting itself at the front right corner of my main garden, a glorious proud display. 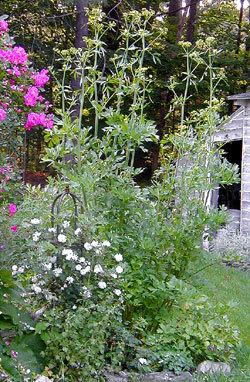 This is the personality that impresses me: for a week or two the tall flower stems draw all eyes. Then when the flowers are fully open, the weight of rain eventually breaks most of the flower stems, which are thick but brittle. I think of this as the plant bowing to the progression of the seasons. I cut the stems that break, and other plants become the main display. I leave a few flower heads to mature to the big seeds  which I carefully pick off so they don't self-sow; one of these big plants is plenty!